What's going on with the website? Not much, just thinking about what's next! In the meantime however, the second edition of The Strawberry Bricks Guide To Progressive Rock will go OUT OF PRINT in April 2019 . Have you published another book on progressive rock? Yes. 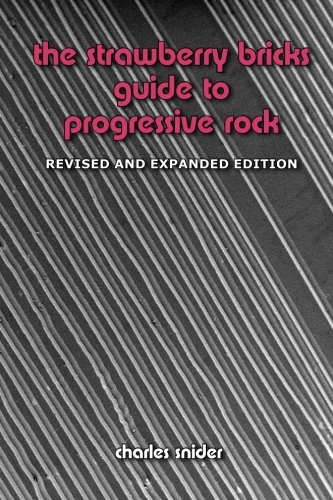 Written by its webmaster, Charles Snider, The Strawberry Bricks Guide to Progressive Rock, Revised and Expanded Edition (2017) is the definitive progressive rock record guide. The book is a compilation of the content posted here in the timeline, and a lot more (632 pages! ), including a definitive discography, prologue and epilogue of the progressive era, plus exclusive interviews with 16 legendary artists. The second edition was published on April 22nd, 2017 and will go OUT OF PRINT in April 2019. The book is available directly from our print-on-demand publisher, Amazon.com. It is also distributed via Amazon in the UK and Europe. Book stores may also order the book via traditional channels, using its ISBN: 978-0578189024 directly from Amazon.com. For bulk orders, or for signed copies, please use the contact form at the bottom of the page. What is the website all about? It is a record guide to music of the progressive era of rock music. It charts and follows music from a discrete generation of men, mostly released in the mid to late 60s and onto the early 80s, the so-called "classic" era of progressive rock. Strawberry Bricks was a timeline poster first printed in 1991 documenting "twenty-five years of progressive art rock". The internet was nascent in those days yet the project succeeded on a few levels, including going out of print. Fast-forward to 2000, and Strawberry Bricks reinvented itself on the world wide web at its home site www.strawberrybricks.com The book first edition of the book saw publication in 2007, while the second edition was published in 2017. The basic tenant however still prevails: the document of a record collection. Okay, but what does "Strawberry Bricks" mean? It's a quote from Jon Anderson of Yes, in response to a question regarding what category Yes music fit into. Click here to listen. Why does the timeline end in 1982? That's the scope of this site, the so-called "classic" era of progressive rock. Exclusive interviews Charles has conducted with artists from the timeline. The book includes some 16 of these insightful interviews that help paint a "portrait" of how these various artists grew up and what influences forged their music. Expect a lot more in the future! Where do you get the discography information? The primary source for discography data on this website is Discogs.com via their API. This information is shared via a public domain license. More information about Discogs.com and their API may be obtained here. Is this a commercial website? No, Strawberrybricks.com is strictly a not-for-profit venture. Donations may be made through the Paypal block on the right. Did Matt Howarth publish a companion sci-fantasy novel to the record guide? Yes. From Matt: "Progression (is) an exciting adventure that combines fantasy, heroics and progressive music in an epic tale. Angler is a dashing swashbuckler who believes he's visiting imaginary realms inside his own head. But after rescuing a talkative scarecrow, the boy discovers that these universes are not only real, but they appear to be based on old prog rock albums. In a reluctant alliance with a cryptic wizard named Uriah Marx, Angler must travel far and wide to rescue his imaginary girlfriend and defeat the insidious Noise League before they can deafen everyone. Expect a solid blend of humor and action in this entertaining gem." It comes highly recommended and is also available from Lulu.com. Did you participate in a radio broadcast about progressive rock? Yes, Charles was featured on Sound Opinions show #207, first broadcasted November 13th, 2009: "School of Prog Rock: Jim and Greg explore the fantastical world of Progressive Rock with Charles Snider, author of The Strawberry Bricks Guide to Progressive Rock." You can listen to the show here or download a podcast of the show here. What was that KNOTS CD compilation? Can I still purchase it? Electronica made with Gentle Giant samples. Yes, via Paypal. Check out the details here. The site was designed by Ajenda Interactive Media and special thanks goes out to Robert Gomez for his expertise. Charles Snider is the webmaster. What happened to the domain progressiverock.com? The domain name progressiverock.com is for sale. Please use the contact link below. Only serious offers to purchase this this once-in-a-lifetime domain name. How do I contact Strawberry Bricks? The aim of the site is to be a definitive resource for progressive rock and your comments are always welcome. Please use the Contact Form for any inquiry.